My name is Alexander Nicolson and I have been working at Greenspace Live for just over 2 years now and in that time my main responsibilities have been to create gbXML models using the Greenspace Live gModeller plug in for Google SketchUp and to help develop the tool. 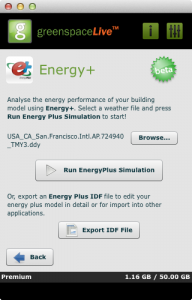 There are other energy analysis plug ins for SketchUp on the market such VE-Ware from IES and Open Studio from Energy Plus but what makes us unique is the fact that the gModeller plug in is still the only way to export gbXML from SketchUp. 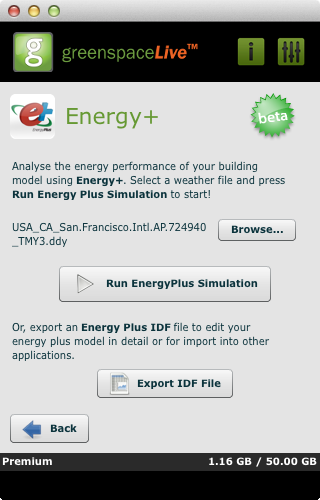 What this means is that unlike other plug ins, you are able to use gModeller as the first step in the energy analysis of your building to take into popular analysis tools such as GBS (Green Building Studio), Ecotect, IES, Design Builder and any other software that supports gbXML. The tool has come a long way in the time that I have been at Greenspace Live. The speed, performance and reliability are constantly being improved and you can now use gModeller to generate gbXML’s of very large buildings. 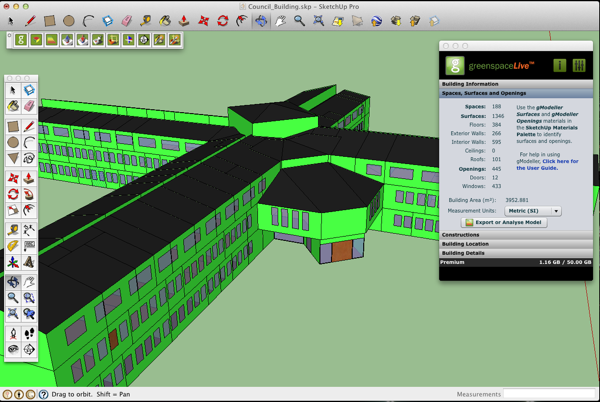 The first task is to model your building in SketchUp using single surfaces for each building element i.e. 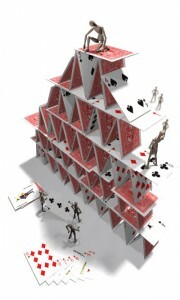 walls, floors, roofs etc. An x-ray view of a building model which is suitable for gModeller is shown below. 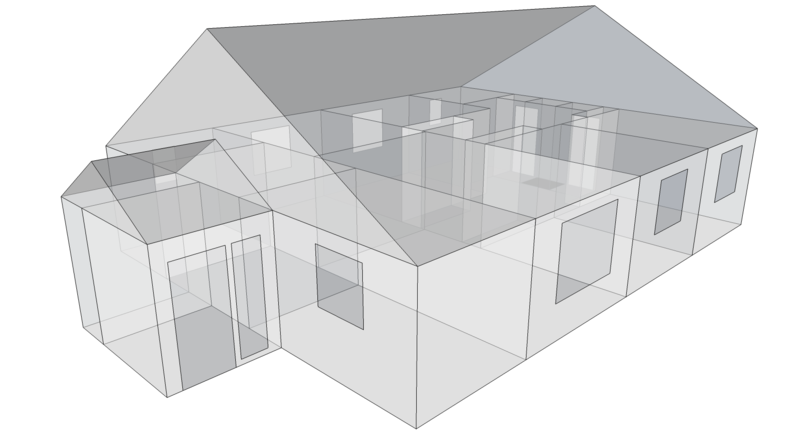 Still the most common problem new users of the plug in seem to have is the generating your building model in SketchUp in a way that allows you to use gModeller to generate a gbXML file of the building. I can’t emphasise enough how important it is to read the gModeller user guide prior to downloading and installing gModeller. 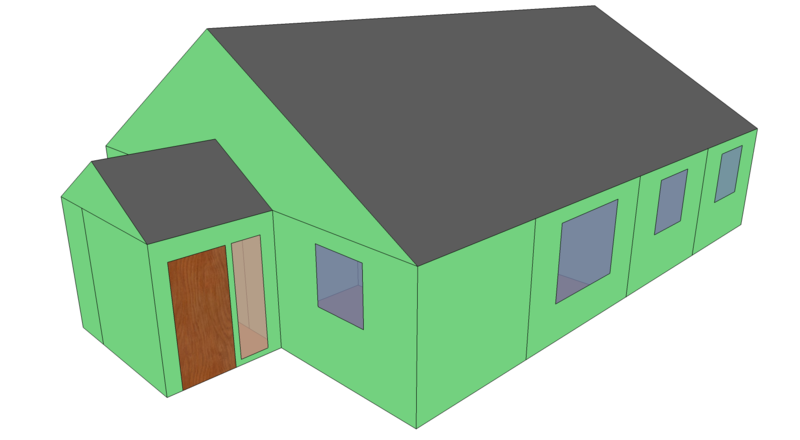 Once you have modelled you building you then populate your model using the SketchUp paint tool by simply selecting the element from the gbXML palette and clicking on the desired surface, basically select exterior wall from the paint gbXML folder and click on all the exterior walls of your building and follow the same process for your floors ceilings roofs, windows and doors. Once you have done this you then have to identify all the spaces in your building and this is done using gModellers select space and create space tools. Using SketchUp’s section plane tool allows you to view the inside of the building, using select space you click on part of the floor of a zone and gModeller will automatically identify all the surfaces which make up that space and you simply name appropriately and continue this process until you have identified all the zones in your building. Once that is done you are then ready to export your gbXML and use it for energy analysis purposes. We are constantly looking for ways to develop and improve gModeller. The next release of gModeller, coming this month, will see the biggest developments in the tool in my time at Greenspace Live. The main new features we are currently developing are an auto-apply surfaces button option and an auto-apply spaces option. These new features will dramatically reduce the time taken to generate a gbXML by eliminating the task of manually assigning the gbXML surfaces and spaces in your building model. Other improvements include a gbXML data sheet; giving you detailed information about your gbXML which will highlight any errors that may be present in your building model.